It's Monday. We've all got a case of the them sometimes. The work week can seem daunting when you have 5 (or more) days ahead of you. I won't lie, when Monday rolls around I'm often thinking "Not this again," as I roll out of bed. But don't worry! There are ways to combat those Monday blues and make your week brighter and more tolerable. Try these 5 tips to make it through until Friday happy hour... and every week after that. Water does wonders for you. Staying hydrated is so important, too! Just last week I bought a new water bottle (pictured below) in an effort to help me drink more water. I think I might have a water bottle addiction, but I really like this one. First off, it's 32 ounces, which is the largest water bottle I've seen that also has a basket for fruit and veggie infusions. I love infusing my water with fresh veggies or fruits - it helps spice things up a bit (and in turn drink more since it's tastier) and, I'll be honest, I think it looks cool to have bright colored fruit added to a nice water bottle. Some of my favorite infusions: cucumber, strawberry + orange, lemon + blueberry, pineapple. This tip is two-fold. My first tip is to add some leafy greens to your work week lunches. Spinach, kale, arugula, collard greens... they all have great health benefits. You don't have to have a salad either, although this Cranberry Avocado Spinach Salad with Chicken and Orange Poppyseed Dressing (from Cooking Classy) sounds amazing! Try adding them to a smoothie or using lettuce or kale leaves as a soft taco shell. My second tip in this category is to spruce up your office or desk with a potted plant or bouquet of flowers. Having a living plant in your office can brighten up the place and add some life (literally) to an otherwise boring cubicle. Seriously. Go take a walk on a nice sunny day. Get out from behind your desk, take your eyes away from the computer screen, and go enjoy the outdoors on your lunch break. Getting some fresh air and movement in the middle of the workday can do wonders for productivity and focus. In fact, one study addressed exactly that, and was written about in The New York Times. I know you know that exercise has many health benefits, but it also helps to calm your mind on stressful days. Whether it's getting into the gym, exercising at home, going for that morning run, or even getting yourself to a yoga class, whatever your exercise of choice is, do it. Recommit to moving your body and strengthening it at least a few times a week. You might be surprised how much better you're able to focus, and hopefully you will feel recharged. If you need some ideas for exercises you can do right in your office, follow my Fitness Friday series here on the blog! As in, get a good night's sleep! Without proper sleep, what do you have? Your head feels fuzzy, your concentration is non-existent, and you just feel run down and lousy. Recently, the National Sleep Foundation put out their recommendations for sleep duration based on age (pictured below). For most of us out there, that would be about 7-9 hours of sleep per night. Make a commitment to yourself to turn off the TV, the laptop, and the lights and start winding down. You'll be surprised at how much better you feel after even just one good night's sleep. If you feel that great after one night, imagine how you'll feel after a whole week! 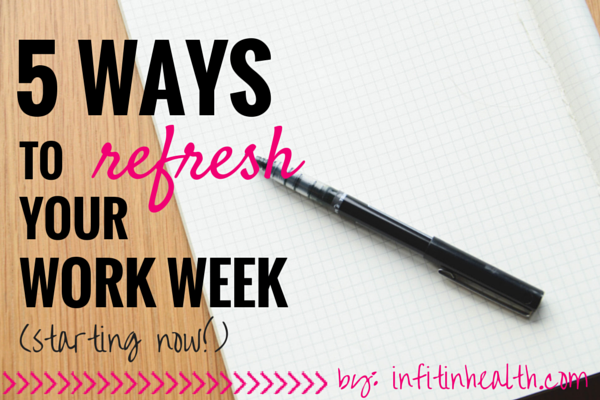 I hope these tips help you start your work week off on the right foot today. I know I'll be aiming for all of these this week! Readers: chat with me! What are you trying this week to feel refreshed and focused? Do you have any tips you swear by that you don't see here? I'd love to know! Leave a comment and share with the community. 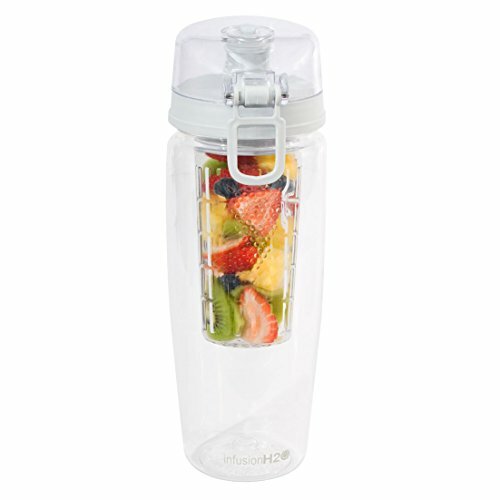 Getting your workouts in and eating healthy are more than possible when you're on the go! It just requires some planning. I've been out of the office for work most of this week, and therefore I didn't have access to a fridge or microwave like I usually do. I had to be strategic about snacks. I also had to be strategic about workouts too, since the workday was unusual and didn't allow time for my usual kickboxing class at night. Check out my tips below for ways to snack healthy and fit in a workout if you're not in your usual environment. Taking the time to pack little snacks for yourself can save you time in the long run, not to mention money AND calories! You save time in your day by not needing to run down to the store or go through the drive-thru. Money is saved if you can stock up on certain things (yogurts, fruits, nuts, etc.) and the calories you can save by eating fresh, nutritious foods will help in keeping the pounds away. Portable and healthy are the two criteria for me when I'm packing my mini cooler for the day. Small baggies or tupperware containers are your best friends here and ice packs also come in handy if your snacks need to stay cool for a while (e.g. yogurt). Check out my list below of go-to snacks to curb hunger while out and about. I hope this helps you plan your day if you're out of the office and on the go! Save the workout image (and snack options, too) to a Pinterest board or to your phone so you have it with you and ready to go at a moment's notice! Readers: chat with me! Do you have any snacks that you like to have with you or exercises that you like to do while you're out? Comment and share them with everyone!